Many species of squirrels live in a variety of habitats, including western gray squirrels in balmy woodlands in California and eastern squirrels in snow-laden forests in Canada. In some areas, such as the Rocky Mountains, squirrels have to compete with bears for rose hips. Although helping to feed squirrels around your home can supplement their natural diet, baby or injured squirrels require the attention of an expert wildlife handler, according to the Second Chance Wildlife Center. They aren't suited to becoming pets and can easily become malnourished or die of shock. The clever foraging habits of squirrels have led to common terms such as "squirreling money away" and '"storing up nuts for the winter." Observe squirrels and you'll witness their food-storing habit in action. Their food may include nuts, tree seeds, buds, lichens, fungi and berries. Their diets vary by species and location. Squirrels dig holes or use natural hiding spots to stash nuts and other foods for future eating. In the fall, when many plants no longer bear berries and other sources of food become scarce, brightly colored rose hips attract squirrels and can be fairly easy to find even in the snow. Rose hips make great treats for squirrels any time of year. If you prefer not to have squirrels foraging among your rose bushes, cut the rose hips and offer them to squirrels by leaving them in crooks of trees or squirrel feeders in view of your windows. 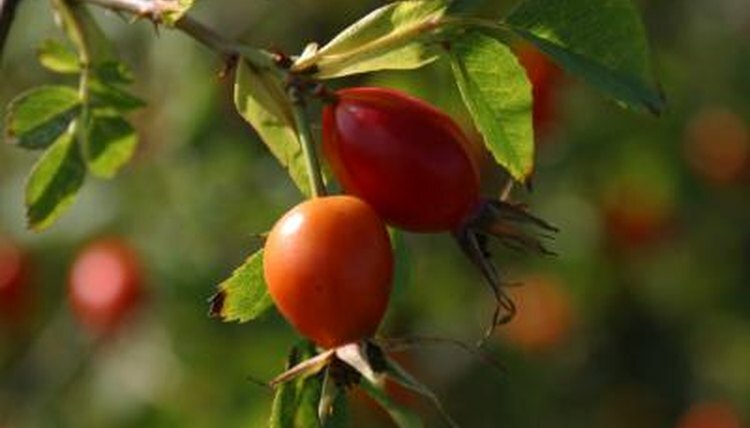 Dry rose hips or purchase them to use by themselves or mixed with other treats such as nuts to fill squirrel feeders. It's safer for you and the animals to use feeders than to attempt to feed wild squirrels by hand. Certain squirrels can be very aggressive about food and may scratch or bite. What Are the Dangers of Feeding Squirrels?